Anyway, I decided to take up bowhunting, but I have to admit, I am a little intimidated. I’ve been hunting lots of times before, mainly with the most redneck of my redneck ex-boyfriends, who did all the planning and preparation to let me have that one glorified moment of pulling the trigger. I would be a fool to think those few exhilarating seconds of making the kill weren’t led up to by lots of careful thought and perseverance. I realized that if I’m gonna get some game on my own, I had work to do. I got busy. So far I’ve obtained my hunting license, secured a tree stand on loan from my dad, watched roughly 1,459,238 youtube videos on everything from looking for antler scratched trees to gutting the big boy. I had my eye dominance checked (turns out I’m a righty who’s left eye dominant!,) got my draw length measured and ordered my bow- I’m now a proud owner of a pink camo Craze by Mathews. I’ve been nailing peanut butter jars to trees and spreading around apples and cucumbers and cantaloupe rinds. I swiped a bale of straw from my Momma’s hayloft for some target practice, so now with a little improvement on my aim, I’ll be counting down the days til September 29th, opening day. Wish me luck~ hopefully I’ll be posting venison recipes this fall. For now, it’s chicken again. Cut the garlic clove in half and rub the cut side all over the chicken breasts, then discard. Grill chicken over an open flame until it is cooked through. Season tomato slices with lots and lots of salt and pepper. 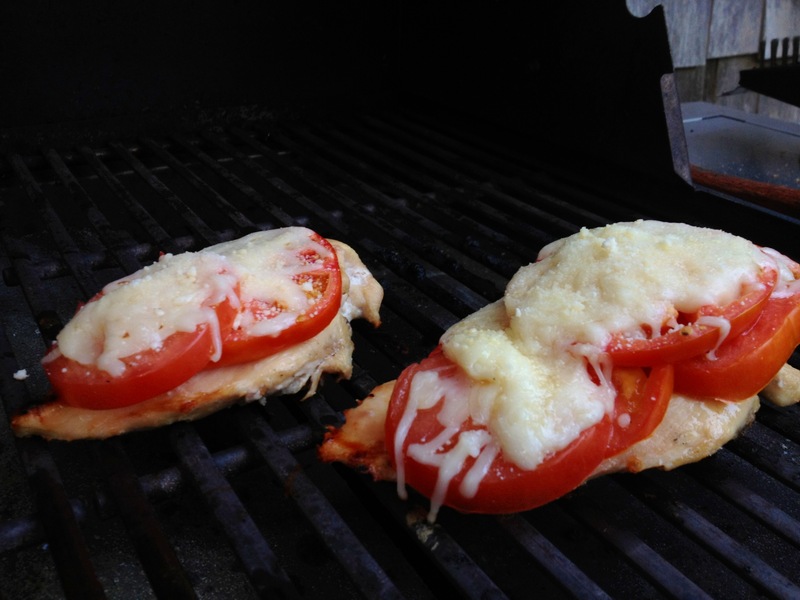 With the chicken still on the grill stack the tomato slices on top, then the mozzarella cheese and parmesan cheese. Turn the grill off and close the lid, allowing cheese to melt. I know this recipe seems kinda simple but it’s delicious, especially if the tomatoes in season. Tide underneath my stand. 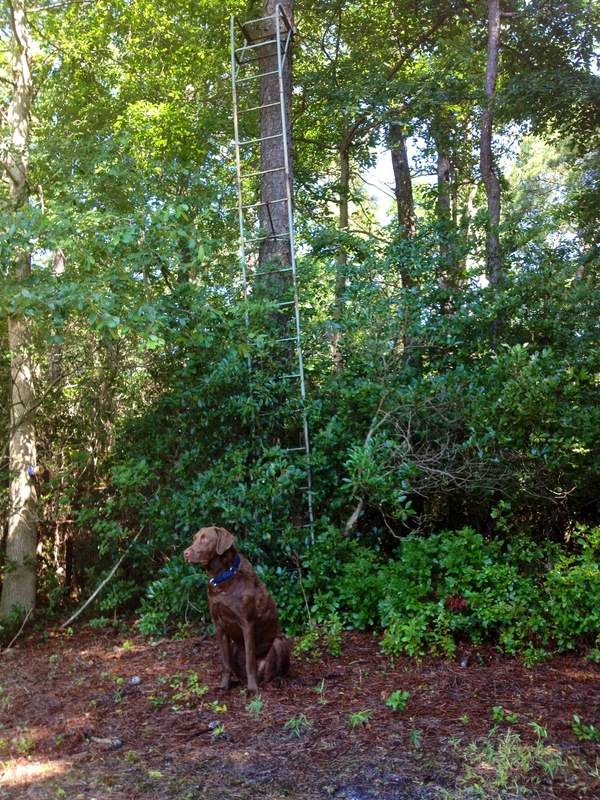 He thinks he’s my scout. Little does he know he’s really just stinking up the place with the smell of dog.